On February 26, 2019, the Environmental Protection Agency published an article highlighting an air quality study led by Dr. Laura McGuinn from the Icahn School of Medicine at Mount Sinai and Ward-Caviness colleagues. The researchers observed that long-term exposure to PM2.5 increased the number of small, cholesterol particles in the bloodstream of the individuals who underwent cardiac catheterization and therefore may make susceptible populations more prone to cardiovascular disease. The study is the first of its kind to describe these new cholesterol biomarkers that focus on size rather than total cholesterol in the blood. The results are published in the January issue of the journal Environmental International. To read the full article click here. This entry was posted in In the News on February 26, 2019 by mountsinaitceee. On February 15, 2019, Dr. Roberto Lucchini spoke to Vox about the rise of chronic kidney disease in Central America and how it could be linked to the rise in temperatures. When people are exposed to long stretches of extreme heat, they sweat more. If they don’t rehydrate, or don’t have access to clean drinking water, the kidneys, which are supposed to filter waste and regulate fluid in the body, get stressed. Over time, that stress can lead to kidney stones and chronic damage. Dr. Lucchini, an environmental and public health professor at Mount Sinai, who’s been studying the phenomenon, calls this the first epidemic that’s directly attributable to climate change. “It was not recognized before the rise in temperatures,” he said, “and the epidemic of these cases is currently observed in the countries that are more affected by [global warming] in the last decades,” from Central America to India and Southeast Asia. To read the full article click here. This entry was posted in In the News on February 15, 2019 by mountsinaitceee. 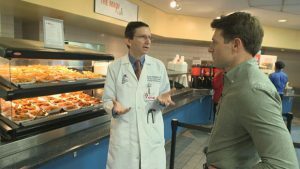 On February 03, 2019, Dr. Scott Sicherer spoke to CBS news about gene-environment interactions and their role in allergy development. Dr. Scott Sicherer, who directs the Jaffe Food Allergy Institute at Mount Sinai Hospital in New York, says there are a lot of theories as to why there’s been an increase in food allergies: “It goes from everywhere from what we call the hygiene or cleanliness hypothesis to vitamin D, to the way that the biology of our body may have changed, or even the food supply.” To read the full article click here. This entry was posted in In the News on February 3, 2019 by mountsinaitceee.